The most important tool you will use on this test is the Periodic Table of the Elements. The Periodic Table gives you very basic but very important information about each element. 1. This is the symbol for the element; carbon, in this case. 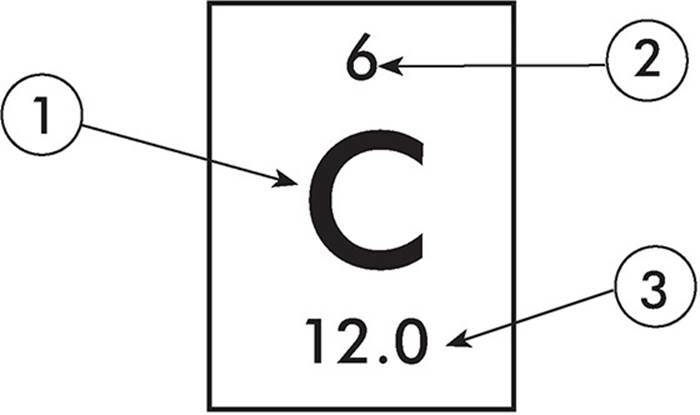 On the test, the symbol for an element is used interchangeably with the name of the element. 2. This is the atomic number of the element. The atomic number is the same as the number of protons in the nucleus of an element; it is also the same as the number of electrons surrounding the nucleus of an element when it is neutrally charged. 3. This is the molar mass of the element. It’s also called the atomic weight. The horizontal rows of the periodic table are called periods. The vertical columns of the periodic table are called groups. Groups can be numbered in two ways. The old system used Roman numerals to indicate groups. The new system simply numbers the groups from 1 to 18. While it is not important to know the specific group numbers, it is important to know the names of some groups. 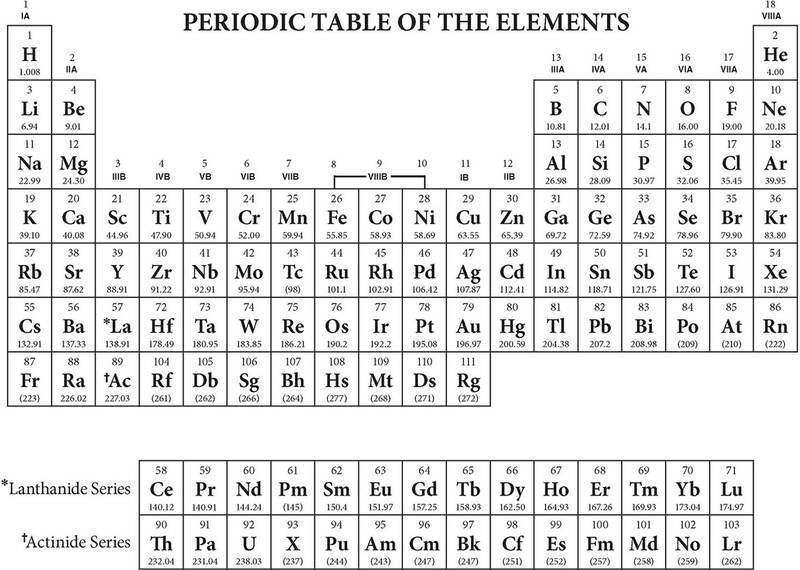 In addition, the two rows offset beneath the table are alternatively called the lanthanides and actinides, the rare earth elements, or the inner transition metals. The identity of an atom is determined by the number of protons contained in its nucleus. The nucleus of an atom also contains neutrons. The mass number of an atom is the sum of its neutrons and protons. Atoms of an element with different numbers of neutrons are called isotopes; for instance, carbon-12, which contains 6 protons and 6 neutrons, and carbon-14, which contains 6 protons and 8 neutrons, are isotopes of carbon. The molar mass given on the periodic table is the average of the mass numbers of all known isotopes weighted by their percent abundance. 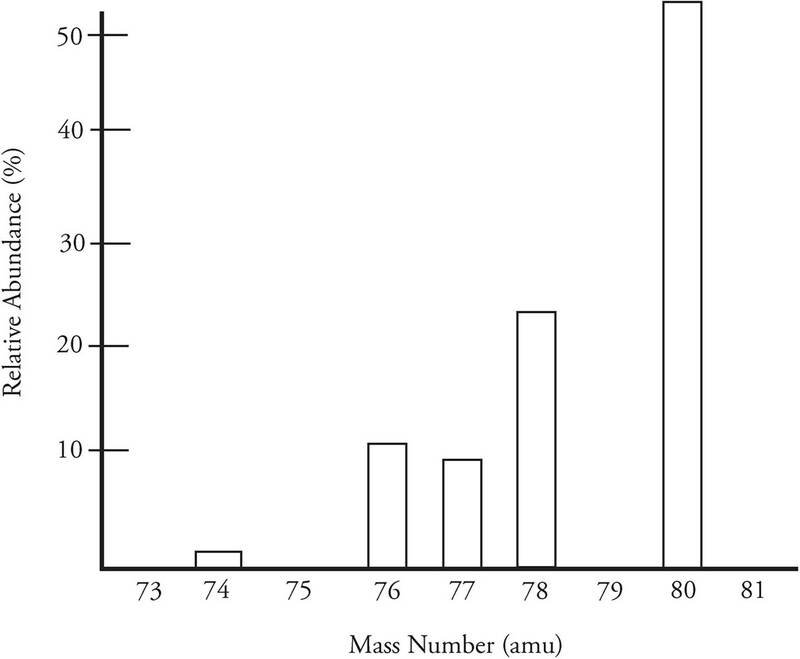 As you can see, the most abundant isotope of selenium has a mass of 80, but there are four other naturally occurring isotopes of selenium. The average atomic mass is the weighted average of all five isotopes of selenium shown on this spectra. The molar mass of an element will give you a pretty good idea of the most common isotope of that element. For instance, the molar mass of carbon is 12.01 and about 99 percent of the carbon in existence is carbon-12.